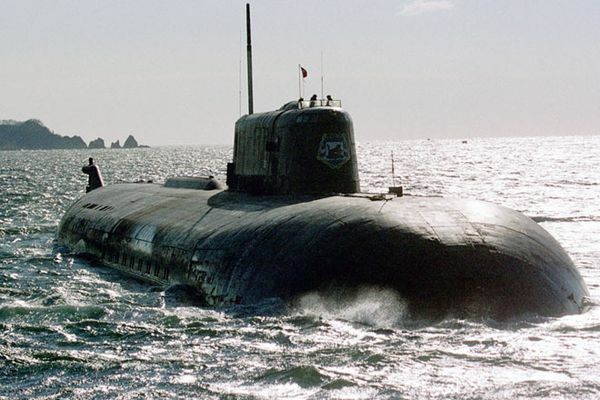 Russia is building the biggest nuclear submarine in the world. As reported by "Izvestia", we are talking about the project 09852 submarine "Belgorod" was developed by design Bureau "Rubin-Sever" — the Severodvinsk branch of the St. Petersburg CDB "ruby." However, the record is set not according to tonnage, and the length of the boat. The longest PLA in the world is "Akula" project 941, whose length of 172.5 m. the "Belgorod" almost 12 metres — 184. "Belgorod" is completed on the updated project boat "Antey" (the project of submarines with cruise missiles 949A), the construction of which was frozen in Severodvinsk in 2006. The boat was ready by 76%. The groundbreaking ceremony of a new boat using the hull of the unfinished took place in December 2012. Official sources Belgorod is called large research nuclear submarine, a carrier of manned and unmanned underwater vehicles. Its customer is the Main management of deep-sea research (GOOGIE) of the Ministry of defense of Russia. It is assumed that "Belgorod" will study the bottom of the Russian Arctic shelf, to seek at greater depths the minerals, as well as to lay submarine communication. In particular, using deep-sea submersibles on the seabed will set the atomic submarine modules are intended for charging of unmanned underwater vehicles. The submarine would provide for the deployment of a global system of monitoring of underwater environment, which the military build at the bottom of the Arctic seas. All this functionality, representatives of the Navy list with the inevitable caveat: "according to some", "there is reason to assume", "probably"... it Stems from the fact that "Belgorod", as well as another under construction in Severodvinsk submarine of the project 09851 "Khabarovsk", are the most classified boats of the Russian Navy. And the Main administration of deepwater research has nothing to do with them. This is clearly evidenced by the fact that in the ceremonial laying of the two boats was not attended by no representative of the GOOGIE. There is reason to assume, a pretty good, based on the facts that these boats will become carriers of strategic unmanned torpedo with a nuclear reactor as a power plant, with a unique range of artificial intelligence and 100-megaton warhead. This torpedo was called "Status-6". There are two main evidence, lets talk about the reality of the existence of the "Status-6". At the end of November last year, the Washington Free Beacon bill Gertz published an article citing a statement of the source in the American intelligence services, which States that the Russian seamen have carried out a successful test "of an unmanned nuclear submarine, capable of carrying a nuclear warhead mnogomillionnyj". The trial was attended submarine special purpose B-90 "Sarov". Hertz describes this as a revolutionary weapon because the designers of the U.S. and other technologically developed countries of the world to the idea not yet thought about. Hertz confirmed the existence of a "Status 6". And for the first time about it it became known in late 2015, when, during the television broadcast of the meeting of Vladimir Putin there was a "leak top secret information." Undoubtedly, it was planned: it was the signal sent across the Atlantic that the new weapons capable of guaranteed to make a dent in the defense of North America and produce destruction on a scale that surpasses the attack of several well-known Intercontinental ballistic missiles. That is, it is not just an asymmetric response to the construction of the European missile defense system, and the solution, multiple overlapping and missile defense, and NATO battalions in Poland and the Baltic States, and other potentially aggressive towards Russia, Washington's actions. Transcript of the Western specialists of the slide flashed on the two main television channels, gave a lot of information to understand what is an unmanned underwater vehicle (ABO) "Status-6", developed in TSKBMT Rubin. Was read these words: "Purpose — the defeat of important economic facilities of the enemy in the area of the coast and the application of guaranteed unacceptable damage of the country by creating vast zones of radioactive contamination, are unsuitable for implementation in these areas of military, economic and other activities for a long time." The idea of nuclear superiority is not new. In 60-ies in the Soviet Union began development of a T-15 with a 100-megaton warhead. But at that time there were no components and technologies allowing to bring the idea to a specific product. The motors on batteries of limited capacity are allowed to bring 40-ton colossus in length, 24 meters not more than 30 kilometers. That is, the boat carrier T-15 had to overcome massive anti-submarine defense of the coast of the United States, which was extremely difficult. Yes, and the undermining of such a charge at a distance of 30 kilometers is for the boat was a guaranteed suicide. Since then, technology has gone far ahead. At PPA, as it follows from the decrypted slide, installed nuclear reactor capacity of 8 MW, which provides virtually unlimited cruising range. That is for "Status-6" distance between Europe and America is not the problem. The reactor has a liquid metal coolant, which helps to increase efficiency and significantly reduce noise. It is estimated that such apparatus can be detected with the most sensitive sonar not further than on distance in 2-3 kilometers. That is "Status-6" produces a weaker acoustic noise than the most silent in the world of the submarine "Varshavyanka". Water-jet propulsion allow to develop the maximum speed limits from 100 km/h to 185 km/h working depth of 1000 meters. And another advantage of the "Status 6" is that it is, in fact, the underwater robot with artificial intelligence and able to act independently depending on the situation. Thanks to the excellent characteristics of speed, stealth and depth, "Status-6" has an increased ability to overcome anti-submarine defense of the United States. Even in the case of detection sonar anti-submarine system SOSSUS, which controls the coast of the United States on the subject of submarine incursions, NPA will easily leave any NATO torpedo at maximum speed. Besides, possessing the intellect, "Status-6" is able to perform complex maneuvers. The fastest American torpedo Mark 54 has a speed of 74 km/h, that is, the minimum estimate is 26 km/h. The deep-sea European MU90 Hard Kill torpedo, which was started in pursuit at a maximum speed of 90 km/h is able to walk up to 10 km. The strategy of using "Status-6" may be different. The device can act as a shock weapon and as a weapon of assured deterrence. In the second case, the PPA can come in and lay low, waiting for the signal to undermine the warhead. The signal may be supplied by sverdlovskomu channel since only super-long waves penetrate into the water column. It turns out the weapon of deterrence, ready to work instantly. Without zatrachivaniya time on the approach and "swam". And it will be a very powerful deterrent, which is impossible to ignore. Because the warhead "Status-6", having cobalt section, designed for maximum radioactive contamination of vast territory. It is estimated that at a wind speed of 26 km/h, the radioactive cloud will poison the rectangle of the coast dimensions 1700×300 km. "Status-6" is able to destroy the naval base, aircraft carrier strike groups, aviation ground base. All this is experimentally proven by the Americans themselves. In 1946, the U.S. Navy tested underwater nuclear explosion with a capacity of 23 kilotons. The result was lost completely new aircraft carrier "independence", launched in 1942. After four years of unsuccessful attempts of decontamination it was flooded. But warhead "Status" contains radioactive fission products of cobalt by several orders of magnitude more.